What’s just as exciting as the holiday itself? Planning your airport outfit, of course! Airport clothing has now turned into a worldwide tradition with girl’s, where getting that perfect airport outfit is just as important as planning your holiday clothing for when you are there. The all important airport picture: where your outfit needs to be on point and as trendy as ever. 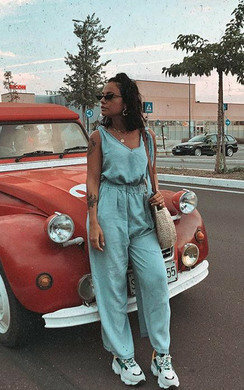 We see many girls go for different looks such as the casual loungewear sets, jeans and a comfy top or even a wide leg jumpsuit! We think whatever look you decide to go for; we will definitely have something for you to wear in this category, that’s for sure! Sliders are a huge YES from us. We think there is nothing better than wearing some comfy sliders in the airport, no faffing about at security, easy to slip off when on the plane and when you reach your hot destination, you will be holiday ready! Another of our favourite pieces of airport clothing to go for is the classic loungewear set! Especially if your flight is long haul there is nothing worse than being unfortunately in a pair of tight jeans. Pick one of our velour lounge co-ords and you will be super chic and super comfy. So get browsing’ our airport clothing collection now and get planning for this summer!